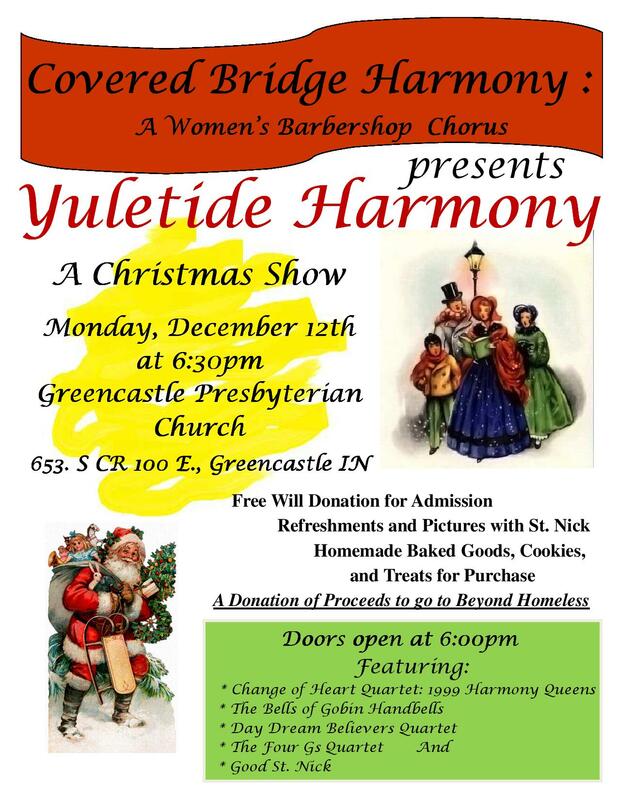 Covered Bridge Harmony to Present "Yuletide Harmony!!" Come hear the songs of this Christmas season. This year's show will feature the 1999 Harmony, Inc. Quartet Queens, "Change of Heart," the "Bells of Gobin" Handbell Choir, our own "Covered Bridge Harmony" Chorus, two in-house quartets including "Daydream Believers" and "The Four Gs," a couple of small groups, and our VERY SPECIAL GUEST, Good St. Nick. Freewill donations will be accepted for admission. Refreshments, pictures with St. Nick, and some friendly harmonizing will all take place in the fellowship hall following the show. In addition, we will have several Homemade Baked Goods, Cookies, and Treats available for purchase. Finally, in the season of giving, we will be donating some of our proceeds to Beyond Homeless. For more information, please contact us at coveredbridgeharmony@gmail.com.